Recipe: Clean Out The Cupboard Goulash! | The Food Hussy! Recipe: Clean Out The Cupboard Goulash! I love goulash - it's one of the first recipes I ever learned to make. It's super simple and is definitely one when I have no idea what to make and need to clean out the cupboard. It's such a comfort food - pasta and tomatoes always make for a great meal after a long day. Cook up the veggies & ground turkey for a couple minutes and then add the mushrooms. This is definitely one of those "clean out the fridge" recipes - if you don't have mushrooms - you're fine - if you have a green pepper - throw it in, have some carrots - throw them in - heck throw in some spinach! As long as you've got tomatoes, meat, pasta - the rest is improv. I have been not buying canned goods because I was trying to use up what I had - well this is what happens. You go to make goulash and then realize you're missing something. Usually I use V-8, kidney beans, tomatoes and tomato sauce - but I was missing some of that - so I took what I had and made it work. What did I go with? Well I had one can of diced tomatoes - CHECK - but um - I was missing the rest - so improv time - what's in the cupboard? Well northern beans - sounds good! I was missing tomato sauce and V-8 - but I had tomato soup - hell that's close enough! 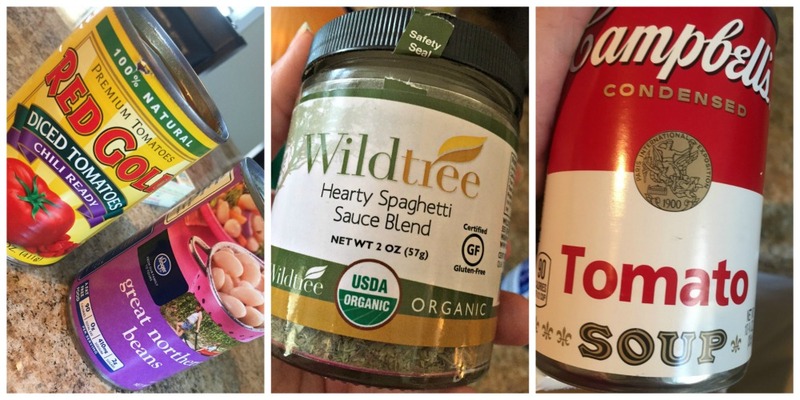 Combine that with my Wildtree Spaghetti Sauce blend and we're good to go! After a quick taste - it still needed something and I remembered I had a sample packet of Garlic Galore from Wildtree - I opened that and it smelled heavenly - I pitched some of that in as well. Normally I would add salt & pepper but they were both in this so I let that do the work. Add it all together and stir it up- then let it simmer for a bit. Taste and see what you think - add a little more of whatever you like. For me it was great! Adding the seasoning really jazzed up the tomato soup. If you like it a little "soupier" - feel free to throw in a half can of water as well. If you're re-heating - toss in some V-8 or tomato juice and you're golden. No recipe one pot #goulash almost like my dad used to make! Ground turkey, mushrooms, onion, red pepper, penne, diced tomatoes, northern beans, @wildtreeofficial spaghetti & garlic seasonings and tomato soup! Don't miss out on the great deal from Green Bean Delivery!